Before you rush out and buy the bike you dreamed about owning as a kid, you need to sit down and decide what you intend to do with it. If you just want to look at it and fire the motor up occasionally to fill the garage with smoke, the type of bike you’re buying isn’t so important. But if, like me, you fancy putting a few miles on the old girl during the summer, you need to be a lot more selective, both on the type of bike you buy and its condition. The Fizzie phenomenon is a prime example. Interest in 1970s sports mopeds has spiraled skyward over the last six or seven years as a whole generation of forty-somethings try to recapture their puberty. This has pushed prices way up and a lot of the ones on the market described as “mint” or “fully restored” look good but are mechanical disasters. Even if you get a good one you’ll probably be disappointed with the performance. Contrary to popular myth an FS1E, AP50 or any of the others from that era won’t actually do 75mph or even anything like it. I’m not saying don’t buy one, just understand that you’ll probably get bored of riding it. At the other end of the scale is stuff like Kawasaki’s KH750 and the GT750 Suzuki. Both are fast enough to go places but, in my opinion, they’re not very nice to ride. I always wanted an early, drum brake GT750 so I ended up buying a really nice one… and never riding it. It just didn’t inspire me. That said they’re more practical than the Kwak and, if you’ve had big bikes like this before and you know what to expect, no problem. For me the best compromise are the lighter middleweight machines; 250 and 350 LC Yamahas, any of the air-cooled RD range, the GT250 or GT380 Suzukis, the KH Kawasakis or a Honda 400-four. They are all dead easy to ride, fun to chuck about and fast enough to go a reasonable distance. If you fancy restoring a bike, choose a model for which all or at least the majority of spares are still available. You can do this by talking to your local dealer or having a quick look on eBay to see what’s out there. For a lot of the early Japanese models, new parts are getting thin on the ground. 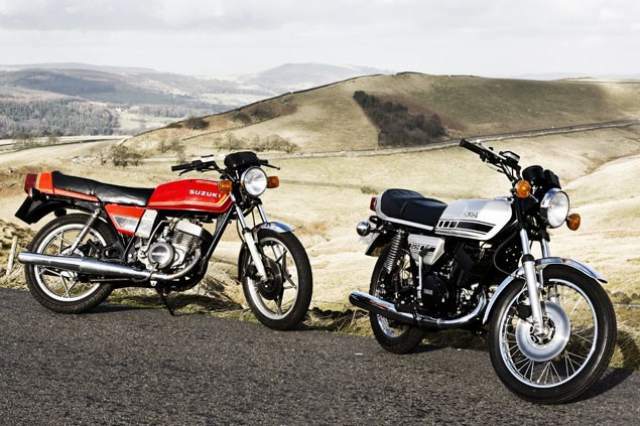 And remember, early Jap four strokes, especially the multis like a CB750 or 400-four, are about twenty times more difficult to restore than most of the two-stroke stuff simply because there are more bits. The best thing about owning bikes like this is the fact that you can have them for years without losing loads of money. So long as you keep up on the maintenance, you’ll always get your money back, or even better. Pretty much everything I’ve bought over the last 10 years has at least doubled in value. But then, I am a canny Yorkshireman! If you’re going for a 1970s moped, buy an AP50 rather than a FS1E. They’re better to ride, with five gears instead of four, and they’re cheaper. SS50 Hondas are slow and all the Italian stuff – Garelli, Gilera, Malaguti etc. – tend to go pop all the time. Suzuki GT250 X7s are underrated. Not quite the kudos of the RD or LC but lighter, loads of fun and cheap. £1500 buys a minter. Pick out future classics. LCs were ten a penny 15 years ago; now you have to pay £3000 for a minter. Early GSXR750s, the first R1 Yamaha and early Blades will become sought-after. If you see something on eBay you fancy, go and have a look – the camera lies. Even if the bloke won’t accept an offer there and then, you’ll be in a better position. Pull on your anorak and join an owners club. They’re useful when you need info or spares.